2. The liability of the members is limited to the amount, if any, unpaid on the shares held by them. 4. (1) The shareholders may, by special resolution, direct the directors to take, or refrain from taking, specified action. the general rule does not apply, and the director may take decisions without regard to any of the provisions of the articles relating to directors’ decision-making. (2) The quorum for directors’ meetings may be fixed from time to time by a decision of the directors, but it must never be less than two, and unless otherwise fixed it is two. 16. Subject to the articles, the directors may make any rule which they think fit about how they take decisions, and about how such rules are to be recorded or communicated to directors. (b) by a decision of the directors. (2) In any case where, as a result of death, the company has no shareholders and no directors, the personal representatives of the last shareholder to have died have the right, by notice in writing, to appoint a person to be a director. (3) For the purposes of paragraph (2), where 2 or more shareholders die in circumstances rendering it uncertain who was the last to die, a younger shareholder is deemed to have survived an older shareholder. (4) Unless the directors decide otherwise, directors’ remuneration accrues from day to day. (5) Unless the directors decide otherwise, directors are not accountable to the company for any remuneration which they receive as directors or other officers or employees of the company’s subsidiaries or of any other body corporate in which the company is interested. 21. (1) No share is to be issued for less than the aggregate of its nominal value and any premium to be paid to the company in consideration for its issue. (2) This does not apply to shares taken on the formation of the company by the subscribers to the company’s memorandum. 22. (1) Subject to the articles, but without prejudice to the rights attached to any existing share, the company may issue shares with such rights or restrictions as may be determined by ordinary resolution. (2) The company may issue shares which are to be redeemed, or are liable to be redeemed at the option of the company or the holder, and the directors may determine the terms, conditions and manner of redemption of any such shares. 23. Except as required by law, no person is to be recognised by the company as holding any share upon any trust, and except as otherwise required by law or the articles, the company is not in any way to be bound by or recognise any interest in a share other than the holder’s absolute ownership of it and all the rights attaching to it. 24. (1) The company must issue each shareholder, free of charge, with one or more certificates in respect of the shares which that shareholder holds. (d) any distinguishing numbers assigned to them. (3) No certificate may be issued in respect of shares of more than one class. (4) If more than one person holds a share, only one certificate may be issued in respect of it. (b) be otherwise executed in accordance with the Companies Acts. 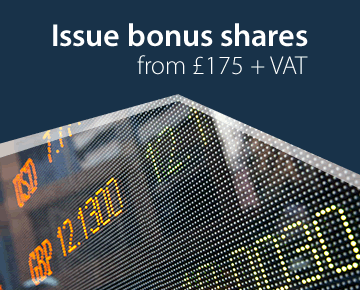 that shareholder is entitled to be issued with a replacement certificate in respect of the same shares. (c) must comply with such conditions as to evidence, indemnity and the payment of a reasonable fee as the directors decide. 26. (1) Shares may be transferred by means of an instrument of transfer in any usual form or any other form approved by the directors, which is executed by or on behalf of the transferor. (2) No fee may be charged for registering any instrument of transfer or other document relating to or affecting the title to any share. (3) The company may retain any instrument of transfer which is registered. (4) The transferor remains the holder of a share until the transferee’s name is entered in the register of members as holder of it. (5) The directors may refuse to register the transfer of a share, and if they do so, the instrument of transfer must be returned to the transferee with the notice of refusal unless they suspect that the proposed transfer may be fraudulent. (3) But transmittees do not have the right to attend or vote at a general meeting, or agree to a proposed written resolution, in respect of shares to which they are entitled, by reason of the holder’s death or bankruptcy or otherwise, unless they become the holders of those shares. 29. If a notice is given to a shareholder in respect of shares and a transmittee is entitled to those shares, the transmittee is bound by the notice if it was given to the shareholder before the transmittee’s name has been entered in the register of members. 30. (1) The company may by ordinary resolution declare dividends, and the directors may decide to pay interim dividends. (3) No dividend may be declared or paid unless it is in accordance with shareholders’ respective rights. (4) Unless the shareholders’ resolution to declare or directors’ decision to pay a dividend, or the terms on which shares are issued, specify otherwise, it must be paid by reference to each shareholder’s holding of shares on the date of the resolution or decision to declare or pay it. (5) If the company’s share capital is divided into different classes, no interim dividend may be paid on shares carrying deferred or non-preferred rights if, at the time of payment, any preferential dividend is in arrear. (b) appropriate any sum which they so decide to capitalise (a “capitalised sum”) to the persons who would have been entitled to it if it were distributed by way of dividend (the “persons entitled”) and in the same proportions. (b) in the same proportions as a dividend would have been distributed to them. (3) Any capitalised sum may be applied in paying up new shares of a nominal amount equal to the capitalised sum which are then allotted credited as fully paid to the persons entitled or as they may direct. (4) A capitalised sum which was appropriated from profits available for distribution may be applied in paying up new debentures of the company which are then allotted credited as fully paid to the persons entitled or as they may direct. (c) authorise any person to enter into an agreement with the company on behalf of all the persons entitled which is binding on them in respect of the allotment of shares and debentures to them under this article. 37. (1) A person is able to exercise the right to speak at a general meeting when that person is in a position to communicate to all those attending the meeting, during the meeting, any information or opinions which that person has on the business of the meeting. 38. No business other than the appointment of the chairman of the meeting is to be transacted at a general meeting if the persons attending it do not constitute a quorum. 39. (1) If the directors have appointed a chairman, the chairman shall chair general meetings if present and willing to do so. must appoint a director or shareholder to chair the meeting, and the appointment of the chairman of the meeting must be the first business of the meeting. 40. (1) Directors may attend and speak at general meetings, whether or not they are shareholders. 41. (1) If the persons attending a general meeting within half an hour of the time at which the meeting was due to start do not constitute a quorum, or if during a meeting a quorum ceases to be present, the chairman of the meeting must adjourn it. 42. A resolution put to the vote of a general meeting must be decided on a show of hands unless a poll is duly demanded in accordance with the articles. 43. (1) No objection may be raised to the qualification of any person voting at a general meeting except at the meeting or adjourned meeting at which the vote objected to is tendered, and every vote not disallowed at the meeting is valid. (2) Any such objection must be referred to the chairman of the meeting, whose decision is final. (d) a person or persons representing not less than one tenth of the total voting rights of all the shareholders having the right to vote on the resolution. 46. (1) A person who is entitled to attend, speak or vote (either on a show of hands or on a poll) at a general meeting remains so entitled in respect of that meeting or any adjournment of it, even though a valid proxy notice has been delivered to the company by or on behalf of that person. 48. (1) Subject to the articles, anything sent or supplied by or to the company under the articles may be sent or supplied in any way in which the Companies Act 2006 provides for documents or information which are authorised or required by any provision of that Act to be sent or supplied by or to the company. 49. (1) Any common seal may only be used by the authority of the directors. 50. Except as provided by law or authorised by the directors or an ordinary resolution of the company, no person is entitled to inspect any of the company’s accounting or other records or documents merely by virtue of being a shareholder. 51. The directors may decide to make provision for the benefit of persons employed or formerly employed by the company or any of its subsidiaries (other than a director or former director or shadow director) in connection with the cessation or transfer to any person of the whole or part of the undertaking of the company or that subsidiary. 53. (1) The directors may decide to purchase and maintain insurance, at the expense of the company, for the benefit of any relevant director in respect of any relevant loss.